Unique and colorful handmade enamel jewelry to brighten up your life! I'm a one-woman business based in Winston-Salem, NC, and I feel so lucky that I am able to make my living doing what I love - creating. I also teach jewelry and enameling classes at the Sawtooth School for Visual Art, and I love being able to share my knowledge of the craft with others. My work focuses on traditional metalsmithing techniques such as shell forming and enameling, but with a contemporary organic style. Much of my work includes the use of torch fired liquid enamel, which allows me to create very unique pieces that still speak to my passion for shape and form but highlight the organic nature of the liquid enamel as well. 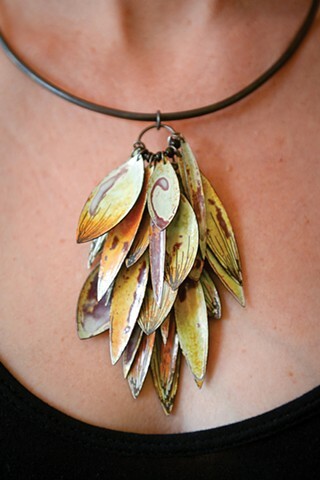 I enjoy pushing the limits of techniques and materials to create one-of-a-kind wearable art jewelry. I am strongly influenced by my love for the natural world, and many of my pieces feature my graphic interpretations of patterns I find in nature. To shop my current work, please click the Shop link above. For an overview of all of the collections and styles that I offer in the form of line sheets, check out Jewelry Collections. And please contact me with any questions you might have or to place a custom order. Please subscribe to my mailing list for occasional updates on up-coming craft shows and workshops, special offers, and previews of new products delivered right to your inbox.